The Travelon Safe ID Daisy ID Pouch is an ID pouch, that can hold ID, coins, currency and lipstick. A hook is provided to attach keys, belt or bag to this pouch. Many debit/credit cards have RFID chips, which contain personal information, hence this case is provided with RFID blocking technology, which effectively blocks RFID readers from capturing information. 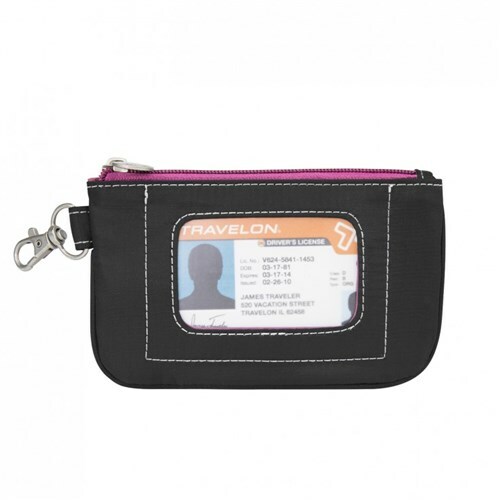 The Travelon Safe ID Daisy ID Pouch-Black has many exciting features for users of all types. You can extend the lifetime of your Travelon Safe ID Daisy ID Pouch-Black with the purchase of a FactoryOutletStore Factory Protection Plan. 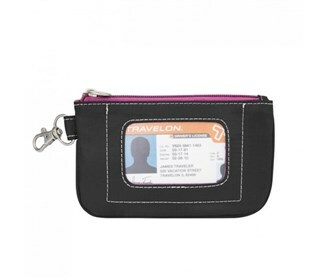 The Travelon Safe ID Daisy ID Pouch-Black is sold as a Brand New Unopened Item.